Most of the marchers had already carried out picket duty outside their respective bases during the course of the morning. All told they also distributed more than 2,000 leaflets to motorists and pedestrians explaining the background to what has become an increasingly bitter dispute with the borough’s parking contractor. The second round of strike action came after the company responded to a strongly supported walkout on 11 and 12 July with what was effectively a worse pay offer. Prior to the first strike NSL management had tabled a proposed three-year deal involving rises on the basic hourly rate of 4%, 3% and 3%. To many of us in local government such an offer might well appear attractive midst the third year of an absolute pay freeze, but then 10% of £8.09 is only 81 pence. After that strike a further negotiating meeting took place on 25 July. There UNISON stewards moderated their original demands, which would have simply resulted in parity with their co-workers on the Waltham Forest contract, also operated by NSL. 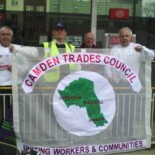 This entry was posted on August 13, 2012 by CAMDEN TRADES COUNCIL.